Recycling Works: Are Potato Chip Bags Recyclable? Are Potato Chip Bags Recyclable? Potato chips are almost the number one snack food among Americans. All flavors and types. According to Frito Lay’s website, “they say they sell about $12 million worth of potato chips so if you break that down into a general $3 per bag, that makes it about 4 million bags sold per year. 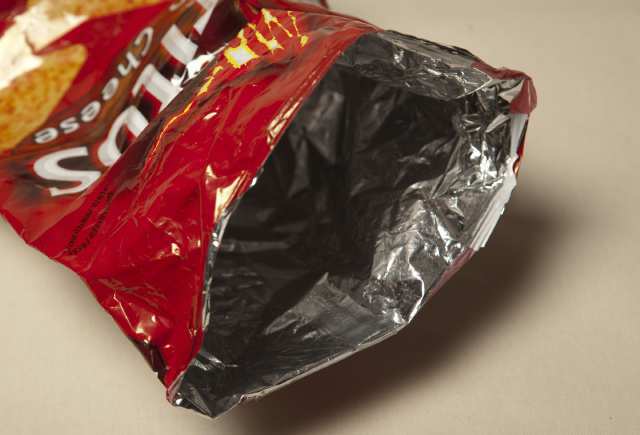 With so many bags of potato chips being sold each year, where should the empty bags go? “Most potato and tortilla chip bags are made from aluminum laminated with polypropylene, also known as metalized polypropylene, or low-density polyethylene film.” They generally are not recyclable in most cities since they are made of mixed commodities that cannot be separated. Regardless of the bags that potato chips come in, they continue to be made up of two or more recyclable materials, making the bags not recyclable items by conventional standards. Are Pet Food Bags Recyclable? How Small Is Too Small To Recycle? What Can Wood Pallets Be Recycled Into?